Why it's not enough just to pay someone a basic salary. Maslow's 'hierarchy of needs' has become a popular tool in the business world for understanding what drives ultimate happiness. We all know that people just want to feel fulfilled, (what Maslow terms self-actualisation) and if they feel happy and confident enough in their jobs, they will become loyal, hardworking advocates of their organisation. As a business, you need to consider what you can do to facilitate your people's drive to achieve self-actualisation, and it's not all about a basic salary. Don't get me wrong, having a basic salary is very important, as without it, we couldn't achieve our basic and security needs. 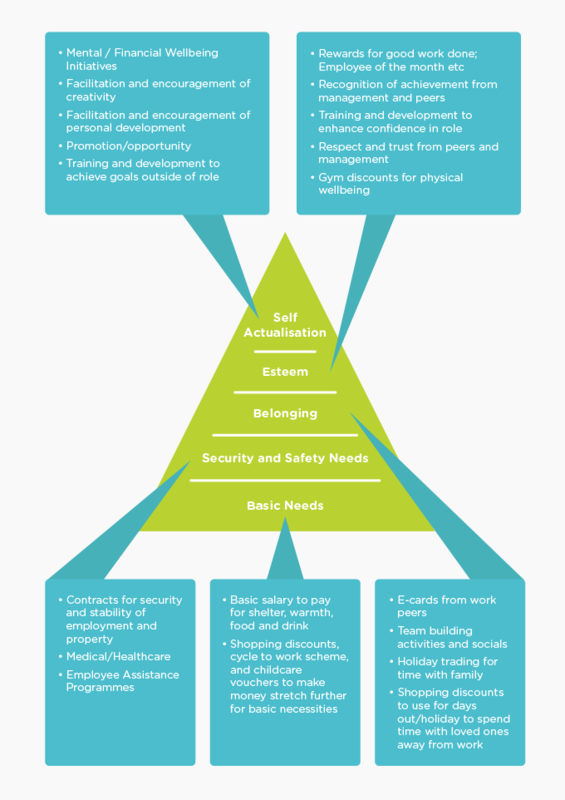 With initiatives such as shopping discounts, childcare vouchers, and cycle to work you can help your employees stretch their salaries further, so they have the money to feel secure, and happily achieve the all important first rungs of Maslow's hierarchy, before working on achieving the next. By communicating a benefits package that reaches people’s other needs, employees can receive gratification that helps them achieve the higher rungs of Maslow's triangle. For example, by offering peer-to-peer recognition, you can help with someone’s sense of social belonging and acceptance in the workplace, which contributes to their feeling of high self-esteem. Having a program in place that allows management to recognise and reward an employees' hard work also contributes to their self-esteem, which means the employee will be happier, and will have the confidence to strive to achieve other goals. Feeling happy and accepted in the workplace makes waking up and going to work a whole lot easier - something a higher salary bracket might not be able to tackle. By offering training and encouraging development, especially if it's in an area not directly involved with someone's job, you can help people achieve other goals to help them achieve self-actualisation. Benefits can also be used to tackle the whole work-life balance thing that's so hot on everyone's lips. If we truly value employees, and we want them to be engaged, then we can use benefits to help them achieve Maslow's hierarchy outside of the office. By offering holiday trading, extra time off, and discounts, we can encourage people to achieve goals outside of work. Think creatively about your benefits package in terms of what it is likely to contribute to someone's sense of belonging, their self-esteem needs, and self-actualisation. Gym memberships, travel and experience culture, learning a new skill or language, spending more time with family and friends, and giving blood are just some of the more fulfilling additions to the total value proposition. I'll use an example of one of my favourite benefits at Reward Gateway. For one afternoon every month, we have 'My Time'. This is an opportunity to have the afternoon out of the office to use for personal development. 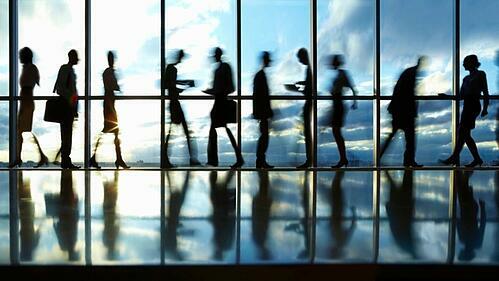 We can use this time to go to museums or seminars, read a book, take a class or organise our admin. The possibilities are endless and our Management team actively encourages us to use this time for ourselves. It's nothing to do with our job, but by utilising this afternoon each month, I get away, relax, develop a new skill, and I always come back feeling positive, cared for, confident - and ready to give back to Reward Gateway. So let's use our benefits offering to make sure our people’s needs are met, so they are happy, motivated and successful, inside and outside of work. Happy people are loyal people, and loyal people tend to be hardworking people, who will advocate your company and stay put - meaning high retention rates for you. In today's digital world, sharing knowledge has never been easier. Sites like Glassdoor and TheJobCrowd make it so simple for advocates to promote your business, and champion your benefits brand in the public domain. On the other side of the coin, it's never been plainer for dissatisfied employees to vent their frustrations with their employers in the same sphere. Now that sites like these have become key for jobseekers when they are applying for new roles, companies need to work harder than ever to promote an awesome, fulfilling, self-actualising company culture.